Web service (API) to create website screenshots. Self-hosted and written in PHP. Caching included. Can run on a normal web server without GUI. 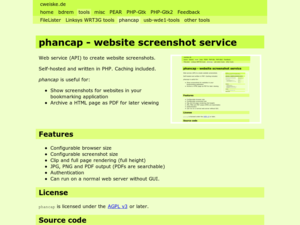 phancap is licensed under the AGPL v3 or later. The .phar file contains all dependencies. Simply put it onto your web server and call it from the browser. More information and setup instructions can be found in the README.